With the support of OSIC Oficina de la Iniciativa Cultural del Departament de Cultura de la Generalitat de Catalunya. The workshop's aim will be to propose intervention and management projects based upon the connection between heritage and cultural practices as elements that shape the landscape in urban space. - The value of common landscapes, those which have primarily embraced everyday life, both currently and in the past, and which therefore have formed the physical framework of collective cultural practices, in terms of constituting a common good which is representative of a local community. - The public capacity of the landscape ('landscape publicness'), as a multiplier of the qualities and attributes of public space when we are situated in different territorial contexts, contexts in which scenic elements may present different valences and characteristics. Proposals will evaluate the assets of urban environmental and cultural landscape; they will explore the possibilities of economic stimulus, innovation and creativity based upon intervention in and management of landscape; and will propose future initiatives to conceptualise “territory” as an heritage network of urban landscapes on the local scale. The workshop will bring together over 30 participating researchers from different disciplines and from different countries, through the participation of European universities integrated into the UNISCAPE network for the implementation of the European Landscape Convention. Thus, collaborative work between students and teachers from Spanish and international universities and from different disciplines ensures a sufficient plurality of perspectives from which to consider the intersection between landscape and heritage, and also to consider how best to use this intersection as a tool for removing obstacles to possibilities for collective creation within the territory. To define 'patrimonial landscape' in general terms, based upon the principles underlying the European Landscape Convention. This approach should allow for the suggestion of strategies, proposals, projects and specific actions which conceptualise urban landscape as patrimony, and urban patrimony in terms of landscape. To put forward, based upon the comprehensive position derived from the above process, initiatives and proposals for intervention in, and management of, the landscape; initiatives and proposals which simultaneously address those elements of environmental and cultural heritage which help to functionally determine the idea of ​​a 'patrimonial network of urban landscapes', basing this determination upon those different elements of value which characterise the districts under consideration, and the environments of their surrounding landscapes. To explore the possibilities, based upon an evaluation of and an intervention in the landscape, of stimulating a collective awareness regarding those items of patrimony which are taken for granted, considering such assets as a means of opening up and inspiring urban innovation and cultural creativity. To propose integrated and transversal means of dealing with landscape, which do not consider urban spaces as bearing labels such as “scenic islands” or “heritage property bubbles”, but which, on the contrary, provide for the integration of the historic fabric with the rest of the city, based upon interventions oriented towards the connection between landscape and its environment, and the permeability between the visual and the perceptual aspects of the landscape's heritage. 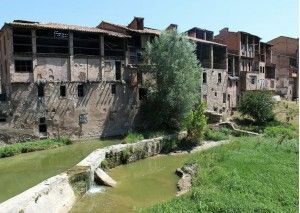 - A new urban definition of the "Adoberies" (The “Tanneries”) as a cultural and scenic district. - A deliberate monitoring of the connection between the city and the river which will permit the integrated consideration of different types of cultural heritage in a number of equally diverse projects. - A prospective analysis of the possibilities of physical and symbolic connectivity between the district under study and the rest of the city. The ultimate goal of the workshop will be the presentation of a set of urban landscape intervention and management projects in relation to the above three questions. Artists, architects, geographers, teachers, educators, social scientists, cultural managers and creators interested in the relationship between cultural, education and social policies. Also aimed at students in these and other disciplines who find common ground with this intersection. Limited places and all the places will have a grant. Registration period until 3th October 2016 at mid night. The Quam is a pioneering activity, in both the Catalan and Spanish contexts, comnbining research, debate, training and production, specialising in the field of contemporary art. Starting in 1988, it has been conducted annually, without interruption, to the present day. Over the years, and adopting various approaches, the workshops and conferences at Quam have been an opportunity for further training of new artists, critics or mediators related to contemporary artistic practices. Since 1991, H. Associació per a les Arts Contemporànies has taken on the burdens of organisation and management, and has always attempted to respond to the needs of the moment. This explains the changes of direction which have occurred at various stages and, above all, the attempts to trace out possible futures. During all these years, many directors have assumed the leadership, each of them imbuing Quam with their own perspective, together building a collective experience which has gathered together several generations of artists, curators, mediators, managers and educators. It has incorporated many voices and different methods, defining a programme which is plural, inclusive and connective, while also remaining permeable to the prevalent concerns of any moment in time. 1988-1996 Florenci Guntín; 1997-1999 Rosa Pera; 2000 Carles Guerra; 2001-2002 Martí Peran; 2003 Hilde Teerlinck; 2004 Glòria Picazo; 2005 Montse Badia; 2006 José Miguel Cortés; 2007 Fito-Arturo Rodríguez; 2008 David G. Torres; 2009 Andrés Hispano; 2010-2014 Ramon Parramon. - Combining expertise in the arts field with topics more open to other disciplines and fields. - Encouraging projects proposed within the field of education as well as the arts, which attempt joint involvements, within contexts of shared permeability. - Strengthening those processes and the various joint and collective actions arising. - Attempting to establish a medium or long term relationship with the context, and to join up informally with other local activities. - Attempting to make widespread those practices which seek to socialise, that is to say, open projects which may be re-appropriated, reproduced and reformulated. - Analysing case studies using innovative teaching methods. - Opening up new pathways between artistic institutions, educational institutions and citizens, in order to promote creative interactions. CAPP is a European programme for research about collaborative art and the proliferation of its practices. CAPP lasts four years (2014-2018), CAPP is internationally supported by the European Union's Creative Europe programme of the European Union and in Spain by Acción Cultural Española (AC/E). -Members of this programme are Create Ireland (Dublín, Irlanda), Agora (Berlín, Alemania), Heart of Glass (Liverpool, GB), Kunsthalle Osnabrück (Osnabrück, Alemania), Live Art Development Agency (Londres, GB), Tate Liverpool (Liverpool, GB), Ludwig Múzeum (Budapest, Hungría) m-cult (Helsinki, Finlandia) and hablarenarte: (Madrid, España). hablarenarte: is the Spanish partner in this European project. Mindful of the recent proliferation of collaborative social practices within Spain, their motivation to partner in the project is the possibility it offers of capacity building and internationalisation of the Spanish sector. The intention of hablarenarte in this project is precisely to help artists to make this leap. In order to achieve this, it has formed a network of four Spanish art centres in different autonomous communities seeking to join forces so as to implement the programme within a broader territory, and to increase the programming of collaborative projects of high social significance in their centres, while promoting the network between Spanish institutions and their counterparts in other European regions. -Members of the national network: ACVic (Vic, Catalunya), Centro Huarte (Huarte, Navarra), Medialab Prado (Madrid) and Tabakalera (Donosti, Euskadi).